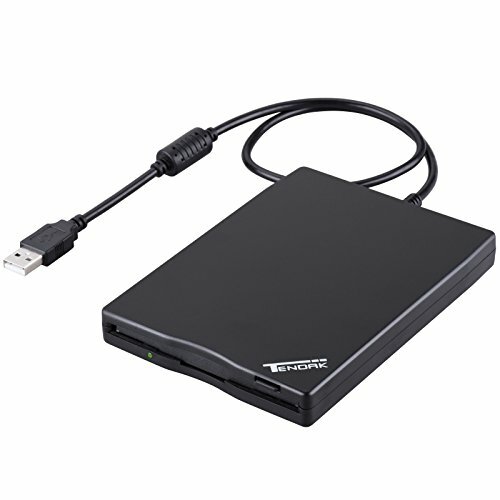 Tendak USB Floppy Disk Drive will read 3.5" Floppy Disks with 1.44mb Capacity, Can be Use for Accessing Information You Have on Floppy Disks. It Simply Connects to Your USB Port and Ready to Access the Information in Your Computer. USB FLOPPY DISK DRIVE - 3.5" USB External floppy disk reader, Reads 3.5" Floppy Disks with 720KB/1.44mb Capacity. EASY TO USE - Plug and play, no extra driver required, just plug it into usb connector directly, it will automatically install driver by itself, with interference preventer. Powered directly from the USB port, no external power required.USB 1.1/2.0 is compatible. DON'T SUPPORT USB 3.0. COMPATIBILITY - Compatible with Windows98/ SE /ME / 2000 / XP / Vista/Win 7/Win 8 /Win10 Notebook, PC, Desktop, for Mac, Dell, Acer, Sony, HP etc.